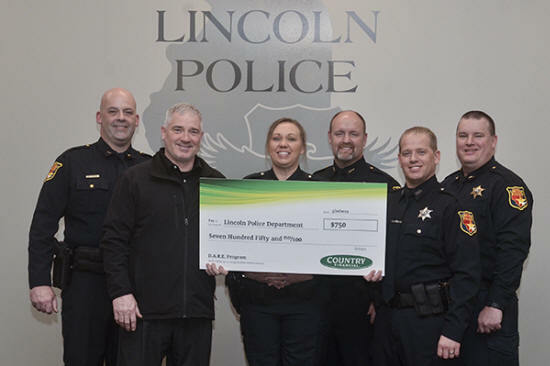 COUNTRY Financial Representative Joe Ryan is pleased to announce Lincoln Police Department as 2019 a recipient of a $750 COUNTRY Financial Operation Helping Heroes Donation. 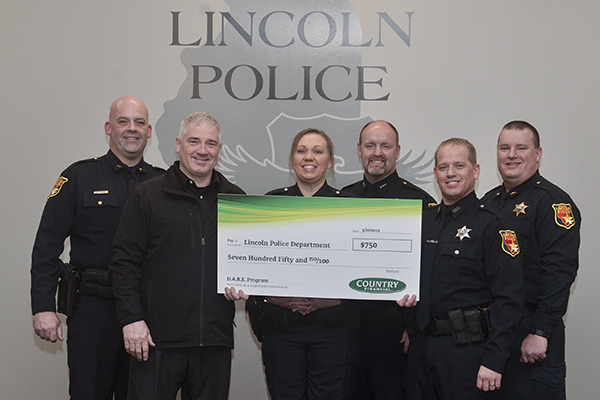 Ryan presented the donation to Lincoln DARE Officers recently to assist with education programs for local students. Three officers, along with Chief Paul Adams and Deputy Chief Matt Vlahovich accepted the donation on behalf of the DARE program. Left to right – Deputy Chief Matt Vlahovich, COUNTRY Financial Representative Joe Ryan, Officer Christy Fruge, Chief Paul Adams, Officer Chad Eimer, and Cpl. Shawn Pettit. COUNTRY Financial initiated Operation Helping Heroes in 2015 to support non-profit events and programs that benefit active duty service members, veterans and their families. More recently, Operation Helping Heroes expanded to provide support for emergency first responders. In 2019, COUNTRY Financial and its financial representatives have already provided more than $500,000 in donations to first responders and service members. COUNTRY Financial serves about one million households and businesses throughout the United States and offers a full range of financial products and services from auto, home, business, farm and life insurance to retirement planning services, investment management and annuities.